I love live albums. 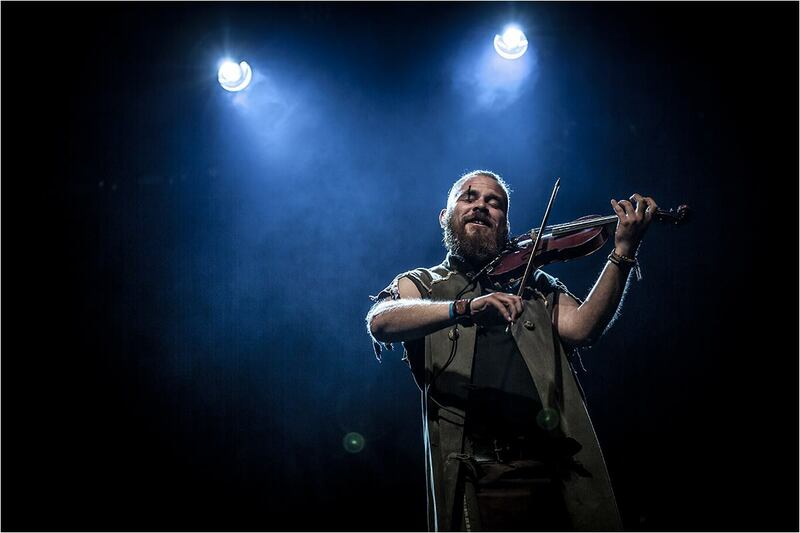 They capture that moment when the creative spirit of the musician meets the energy of the crowd. And when that connection is there, a band will feed off the energy to give their very best. It does not always happen, but every time when that connection ìs there it gives me goosebumps. I’ve been to several concerts where that electric energy was there between the band and us, the crowd and I remember them to this day. To catch something like that on a CD is just magic! 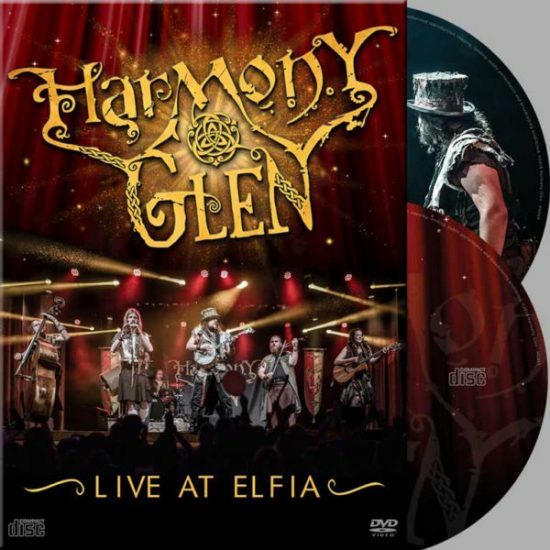 When I heard that Harmony Glen was releasing a second live CD/DVD, knowing the cool positive energy they bring to the stage, and hearing that it was recorded at Elfia one of the bigger fantasy festivals in Holland, I was really looking forward to this CD. Did it live up to my expectations? For a big part it did, a very big part. But I’ll come to that later. Until now they recorded 6 studio and one live album called Live In Bremen. 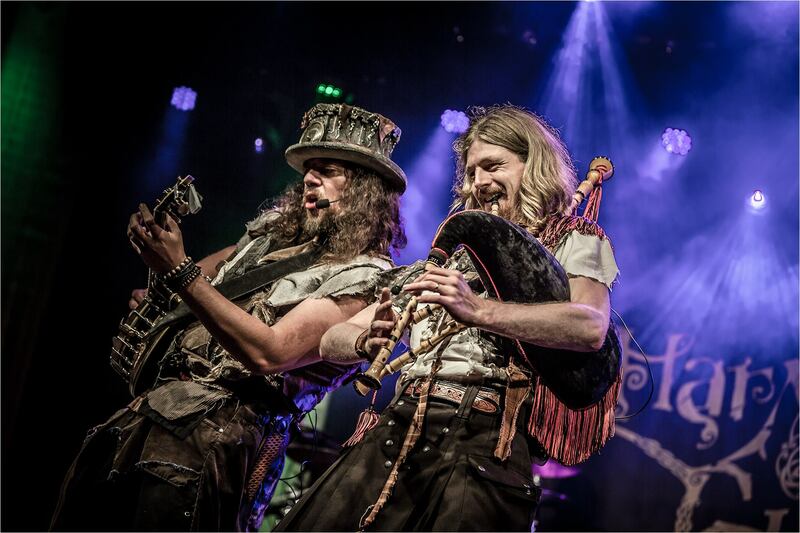 So Live At Elfia is their second live album and already their 8th CD overall. Quite an impressive discography. 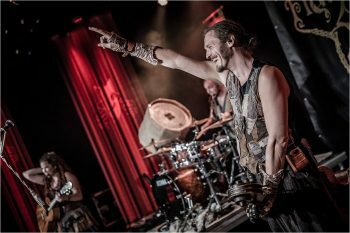 Most of the songs on Live At Elfia are taken from their latest studio album Start Living Today, so people already owning Live In Bremen don’t need to worry, there are just two songs that appear on both CDs. The artwork of Live At Elfia looks stunning. That alone makes buying this album worth all its money. Niels Duindam did a wonderful job on it. The Liner notes accompanying the songs are something special. I’m not gonna give anything away but they are seriously hilarious. And with Hans-Heinrich Breuer of Heiners art they got themselves a quality photographer who made absolutely stunning pictures during the show. They not only grace the CD/DVD artwork, but we were also allowed to use them in this review. So a big thanks to Hans-Heinrich. But reviews are supposed to be about music, not photographers, so let’s put that silver disc in the player. After the intro tape, that is sadly recorded a somewhat dull so it kinda loses its impact, Harmony Glen kicks off with Dave’s Lament which flows over in Slieve Galleon Breas. Dave’s Lament is a really nice instrumental piece. It is carried by a catchy melody played by the flute and violin. Driving bass lines and strong drums give the song some ‘oomph’, making it a really cheerful dance song, especially when halfway through the song the band picks up speed, turning it into a lovely Irish jig. This is a major trademark of Harmony Glen. Take a simple but really catchy violin or flute tune, get the rhythm section under it so it becomes a lovely dance song, play variations on the first theme, maybe mix in a second theme and let the song pick up speed halfway through. 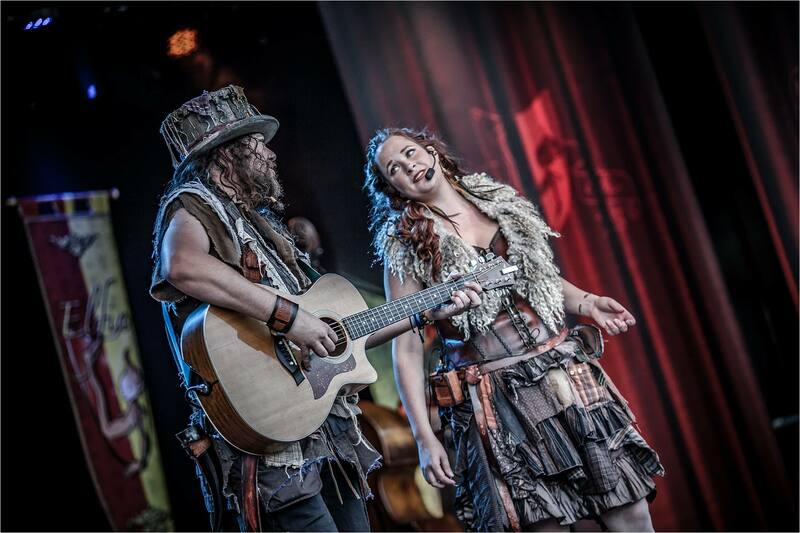 Almost all instrumental songs on Live At Elfia are build up like that and quite a few vocal ones as well. The Phoenix, for instance, is built around a nice violin line by Mike Bruinsma, with Dominique Bentvelsen putting some really cool bass lines under it. Wasting Time starts with a laid back violin melody by Mike, quickly joined by Gilian Hettinga on flute. Just crack open a can of beer, lean back and let yourself be drifted away into a lazy summers evening. Mary And Thyme again starts with a lazy summer festival tune, this time by Gilian and now it is Sjoerd van Ravenzwaaij on banjo who leads the band into a much faster pace. Just listen to that crowd join in halfway through the song. Easily one of my favourite songs on this CD. Lazy Sunday also has that same build, this time I can pick up on the drums of Niels Duindam. He really adds that ‘Oomph’ I was talking about. All of these songs just ooze out a laid back summer festival feel. Just try playing them one after another, it’s impossible to sit still. A different kind of instrumental song is Stardazs. Mike Bruinsma gets his chance to shine with a lovely delicate violin melody, only to be interrupted by Dominique Bentvelsen. 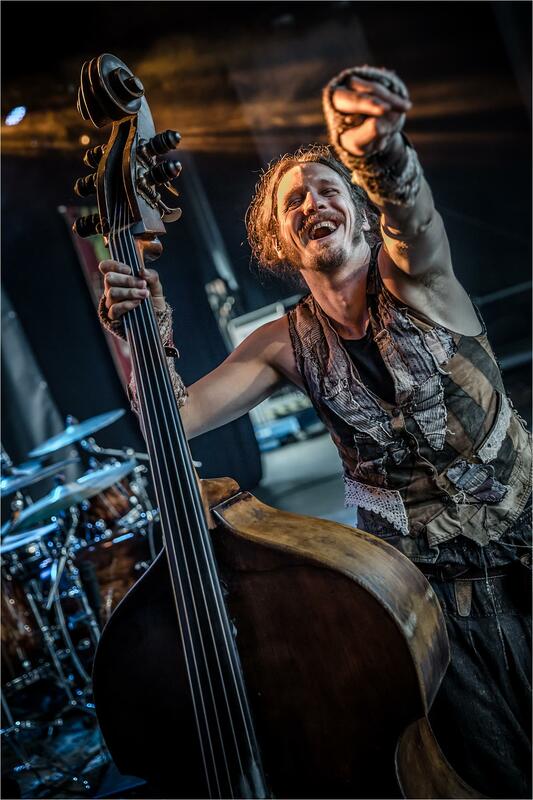 Probably he got a bit bored and therefore throws in his best Darth Vader impression on his double bass. Mike is not flustered and keeps up his tender violin lines… ending it… …with a bit of the Star Wars theme! Stardazs keeps being like this, moving violin solo meets Star Wars theme meets eastern European uptempo gypsy tune. Halfway through the song the band really starts goofing around, making me wish I was reviewing the DVD instead of the CD, but just as easily they pick up the frantic pace of the gypsy solo again. Without dropping a beat! You can hear years of practise and playing together right there. As I said earlier Dave’s Lament flows into Slieve Galleon Breas. We hear the second trademark of Harmony Glen, Sjoerd van Ravenzwaaij. 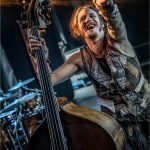 Together with Dominique Bentvelsen he is the positive vibe of the band personified. One minute he is a clown playing with the audience, the next a gifted singer with a warm powerful voice. A pleasure to listen to. On Slieve Galleon Breas Sjoerd unleashes all this positive energy. He is clearly ready to make it the best gig ever. Maybe he has a bit too much energy actually. On stage Sjoerd uses a headphone as a mic, and the microphone is a wee bit to close to his mouth to handle all this energy without a slight distortion. A problem that keeps popping up during the whole CD. Especially with the announcements and cries during the songs to get the crowd going. Putting that point aside, Sjoerd really has a good voice. It’s warm and powerful with just the right amount of sandpaper in it to make the Irish folk sparkle. Two of my favourite songs on the album are sung by him. Someone To Dance With and Caledonia are beautiful ballads. You can hear Sjoerds warm voice in all its glory. You can also hear how nicely Nienke Bijkers soprano blends in with his voice. In a ballad those two really work well together. This also brings me to an aspect of Live at Elfia where unfortunately I have to be honest: the female lead vocals. 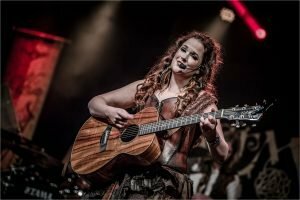 Nienke isn’t a powerhouse soprano. Her voice is more of the fragile angelic kind. On the studio albums she weaves delicate melody lines together that are like intricate lace. It reminds me a lot of Joan Baez’s voice. (For younger readers who don’t know her, check out the old Woodstock albums.) When she takes the lead on stage in The Golden Vanity or Cecile En Lazare I keep asking myself if a brittle voice like hers really works together with the uptempo powerfolk that the band unleashes on stage. I personally don’t think the tempo and the power really work for her voice, but listen to those songs and judge for yourself. The issue I’m driving at starts later on in the CD with the songs Hold On and Black And White. I don’t know if Nienke was out of breath, could not hear herself that well or was losing some of her technique trying to keep up vocally with the power of the band behind her, but especially in the highest parts she sounds shaky, uncertain and at times she really misses the higher notes. It’s a shame really, because straight after Hold On Nienke starts Rest My Little Son singing a capella and suddenly she sounds like the vocalist we hear on the studio albums. Her voice becomes fuller, she regains her technique and is hitting every high note on the head. It makes me wonder how a live album in a more balladesque setting would work for her. Listening to the studio albums I think it would suit her voice much better. But that’s my only point of critique with Live At Elfia. The band finishes strong with the crowd favourite Engel, a Rammstein cover. I’m still amazed at how much power an ACOUSTIC folk band can produce. It really sounds as heavy as Rammstein themselves. Impressive! Commander Keen is the last of the catchy instrumental folk songs, full speed from beginning to end this time with Gilian starting it on pipes. The ballad Caledonia is a beautiful ending to a CD which is overall very enjoyable. Harmony Glen is the ultimate feel-good festival band and they prove it here.